The impetus for the preparation of this thematic issue was generated by the anniversary of the Department of Historical Information Science at the History Faculty of Moscow State University, which noted in December 2014 the first decade of its existence. The Department has been transformed from the Laboratory of Historical Information Science, established on the initiative of academician Ivan Koval'chenko in 1991. The articles presented in this issue reflect the range of research conducted in recent years at the Department. They are grouped by sections, including the methodological aspects of developing Historical Information Science and the results of recent research based on computerized analysis of historical texts, methods of 3D-modeling reconstruction of historical and cultural heritage, application of mathematical models and statistical methods in studies of socio-political and economic processes of the past. 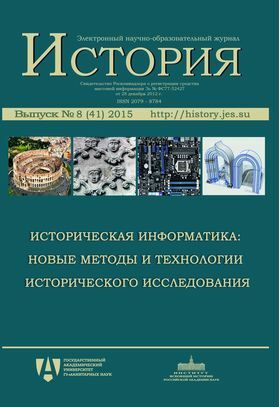 Contributors of this issue are professors, lecturers and PhD students of the Department of Historical Information Science at the History Faculty of Moscow State University. The Historian in the World of Computer Technology: Spiral Development?